Although from our modern day viewpoint all we see is a seemingly innocent looking piece of rock art graffiti its huge asteroid impact significance was unquestionably known by the ancients, obviously closer in time and circumstance to the latest large impact event. The impact event obviously bewildered the terrified ancients. They had no knowledge of asteroids, of asteroid impacts, of how to recognise the effects of an asteroid impact event. Something completely out of their experience had taken place and so they struggled to place and fathom an understandable context on it. To their awestruck minds something had caused that impact commotion and so they, in a vacuum of scientific understanding, imagined a supernatural being, a god was responsible for the commotion. And to act as a visual focus of that imagined supernatural being they naturally turned to use the upraised armed, bow legged rock art form. A choice which made contextual sense for as explained its very form was an artistic visual schematisation of the eruption spectacle itself and so they used its eruption form significance as the template image for the projection of and visual depiction of their various gods, deities and different personas they believed responsible for the impact commotion. For the most part, although there were exceptions, the ancients discarded the bottom bow-legged shape and depicted their idols, gods and deities with only upraised armed postures, a posture then originally from upraised armed rock art depictions that derived from a mushroom cloud sight. 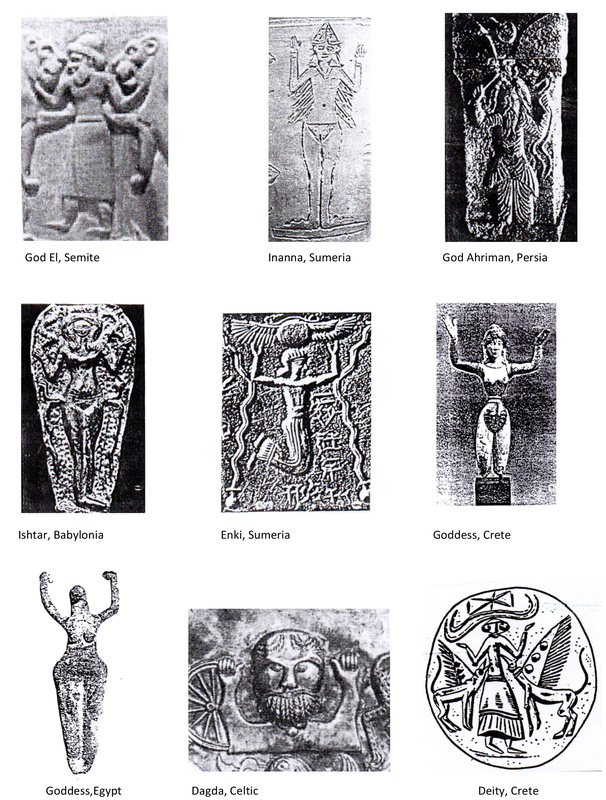 Early cultures effectively assimilated that upraised armed rock art image into their religious iconography, fleshed it out with humanistic visual characteristics and projected all manner of different deity personas onto it, both male and female. Significantly by projecting a deity persona onto it they effectively camouflaged its impact significance from the comprehension of later generations. Later generations only knew such deity imagery held great religious significance for their forbears and duly continued in religious custom to worship such impact disguised imagery. The exact same upraised armed stance was also used by human worshippers in adoration of their up-raised armed deities and idol figurine shapes. This upraised armed stance is still used till this day in religious worship. The worshipper effectively is copycatting and action mimicking with his own body the mushroom cloud image of an asteroid impact, eruption spectacle. 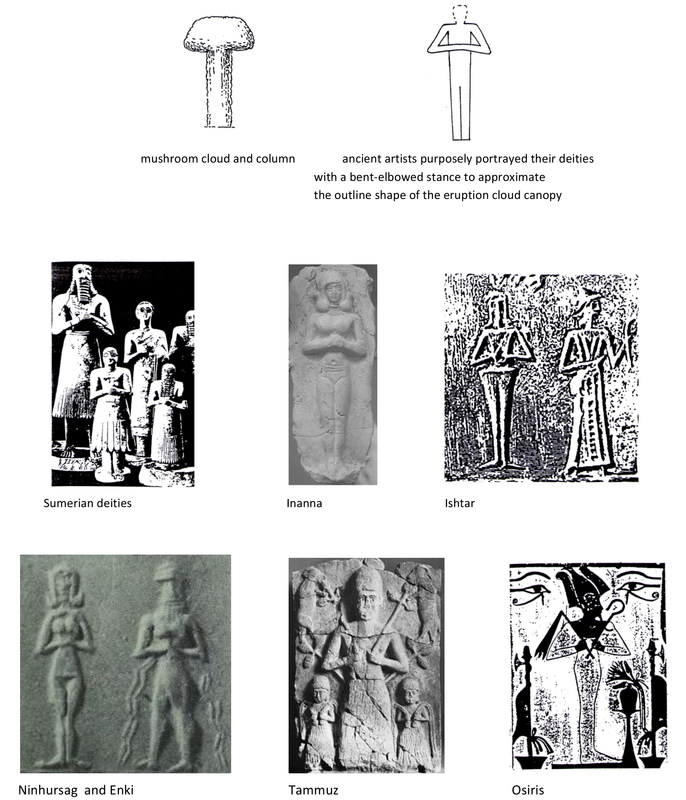 In especially Sumerian and Egyptian art they turned upraised armed deities and worshippers side-on to each other, no doubt because more than one deity persona was projected onto the eruption cloud sight and they wanted to show such multiple deities interacting ‘face to face’ with each other. As stated I believe the asteroid impacted into an ocean and the erupting mushroom cloud rose up from an ocean impact site. If a human worshipper is mimicking with his upraised arms the outline underline shape of the mushroom cloud canopy then his body, torso is the cloud column. We are all familiar in the Western world with the act of Baptism. A believer rises up from immersion in water with his hands held upraised in worship, the trunk of his body standing, with his lower body, legs in water. He is in effect action mimicking in microcosm with his body, the sight of the eruption sequence when the upraised armed, body like shape of the mushroom cloud rose up from the ocean. 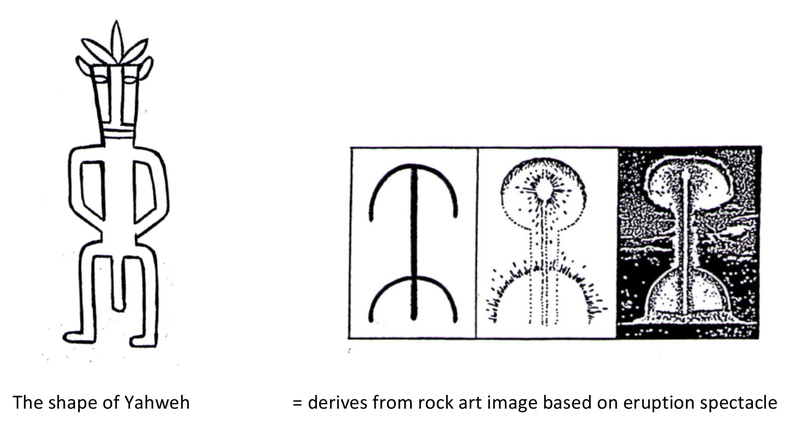 The rock art schematised eruption figure form was also used as an ancillary religious object. The God Zeus is the chief god of Greek mythology. He is usually described in myth and depicted holding a thunderbolt. Below is a picture of Zeus holding his ‘thunderbolt’. It is immediately apparent that the ‘thunderbolt’ he holds is a small, handheld stylised visual replication of the up-raised armed, bow legged figure form originally derived from rock art. That being the case the thunderbolt he holds then is really a visual schematisation of an asteroid impact event. While Zeus is famous for holding his ‘thunderbolt’ we can realise that the thunderbolt image he holds is by no means unique to him. 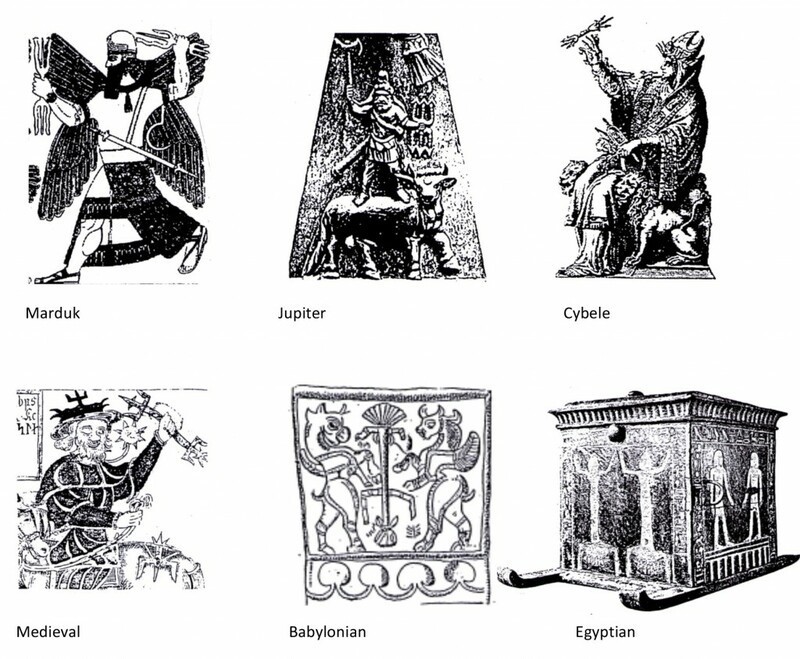 Below we can see stylised versions of the same rock art image being held by other deities such as the Assyrian God Marduk, the Roman god Jupiter, the Phrygian goddess Cybele and even a version carried down into Medieval times. The same image was also used as religious embellishment, as in Babylonian depiction above and on the bottom right depiction used as decoration on the side of an Egyptian coffer. The trident shape was another tangent of interpretation from the eruption sight, the three pronged trident shape was lifted from the top half of rock art depiction without virtually any further artistic embellishment on the part of ancient artists. Perhaps the most famous mythological figure associated with a trident is the Greek god Poseidon the brother of Zeus. In myth we are told the trident of Poseidon ‘stirred the waters to fury’. An ocean impact by a large asteroid would most certainly ‘stir the waters to fury’. Furthermore we are pertinently told Poseidon is associated with earthquakes which given the mushroom cloud impact identity of the trident he holds makes corroborative and contextual sense. Other Gods besides Poseidon also carried tridents including the Sumerian Goddess Inanna, The Hittite god Teshub, the Akkadian god Nergal, the Indian god Shiva and a Babylonian deity depicted below holds a trident image. I will now return to the original schematised rock art form. While most deities were adapted to visually configure in form with the up-raised armed interpretation from the mushroom cloud eruption sight there was another variation of interpretation. Some ancient rock artists, no doubt caused by mitigating effects of light and shadow, did not draw the shadowed underside of the eruption cloud but instead drew the curved outline top of the mushroom cloud canopy. By choosing this visual interpretation when the eruption spectacle was schematised to its bare single line form it resembled a rock art figure form with ‘drooping arms’ as opposed to the other ‘up-raised arms’ visual interpretation. The God Baal-Hadad was a Chief Semite god worshipped by the Canaanites and cognate in origin with the earlier Syrian god Adad. 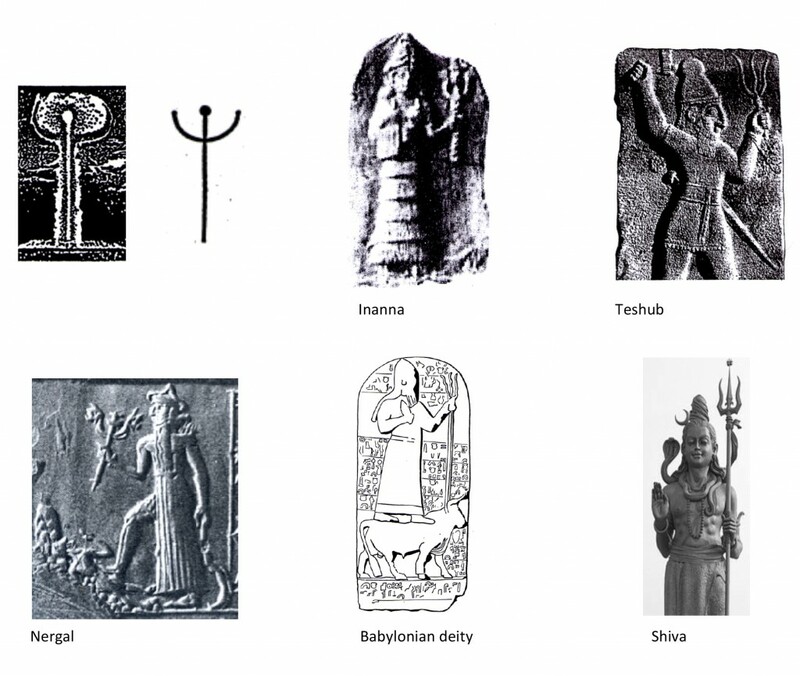 Below right is an ancient artist’s depiction of the god Baal Hadad. 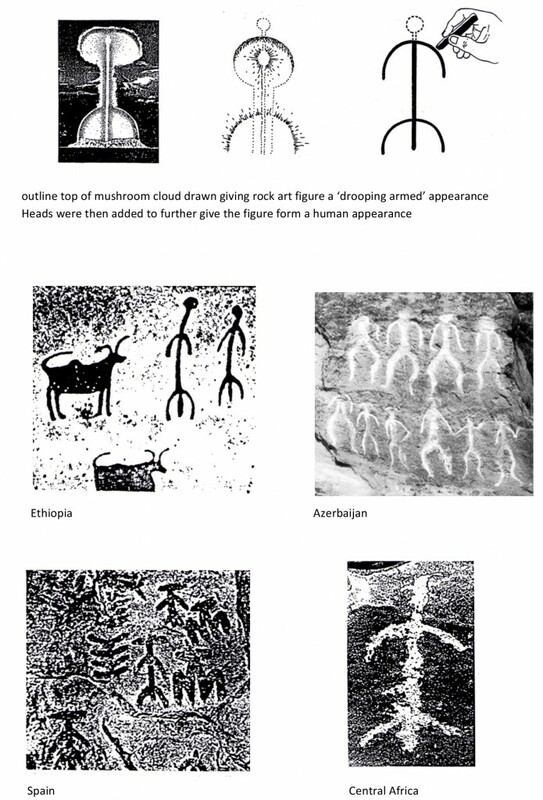 It clearly has the appearance of a figure form that is derived from rock art. As outlined in this case the artist has depicted the curved outline top of the eruption cloud and not the underside and so appears not as an upraised armed deity but as a ‘drooping armed’ interpretation. I believe it is at once clearly apparent that the bow-legged, long phallus form of Baal- Hadad below is an image that the artist has derived and ‘lifted’ from the bow-legged stance of the rock figure form I believe represents a schematization of an asteroid impact spectacle. Baal is depicted here holding a club I believe to act as a visual metaphor for the striking earthshock felt by the ancients when the asteroid impacted and the eruption form his figure represents. The star-like flash depicted between his horns represents I believe the eruption fireball sight. Pertinently Baal Hadad was known as the ‘Thunderer or Crasher’ who ‘convulsed the earth, shook mountains and blasted trees’, a clear reference I believe to the earthshock and destructive blast wave power of the impacting asteroid. He was a god of storms and rain, which if a large impact had occurred, would certainly produce weather commotion on a grand scale and resulting downpours of rain. All epithets that very much sound like the effects from a large asteroid impact which corroborates in context I believe to what his actual impact configured figure form depicts. I believe then the ancient artist here has used the basis of earlier rock art imagery to depict what he believed the God Baal-Hadad to look like and we can view this as the direct assimilation of what was initially a rock art figure form into mainstream archaic religious iconography and then worshipped by succeeding generations in awesome reverence for the asteroid impact god he is. 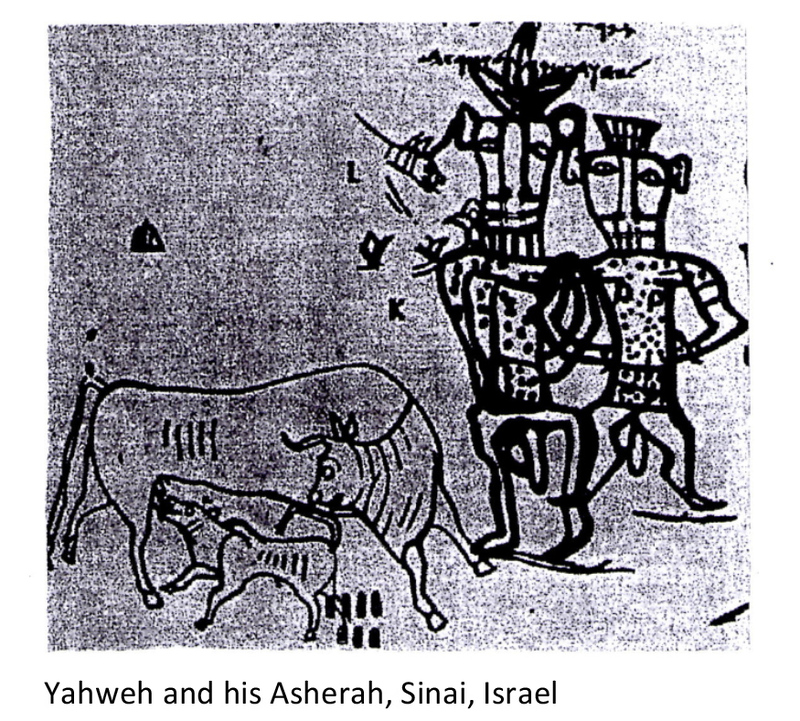 Below is an ancient depiction of the Semite God Yahweh and his consort Asherah. The forms of Yahweh and his Asherah look at first glance decidedly strange but what is obvious is that they clearly derive from and both portray, like the God Baal-Hadad previously featured, the same ‘drooping armed’, bowlegged stance, long phallus image characteristic of the rock art imagery I have detailed and believe is a schematisation of an eruption spectacle of an impacting asteroid. 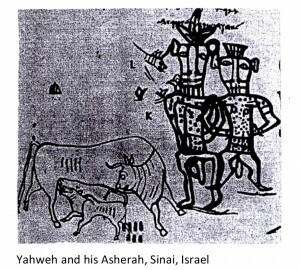 This particular image is significantly important in the context of impact evidence for it was an image that was depicted by a lay person, almost in the form of a doodle, outside the structure of organised, religious directed artwork of that time. This is what the ‘common man’ of the time believed Yahweh to look like. The fact that Yahweh is portrayed like the form of Baal Hadad is understandable for Yahweh is believed to be either a variation of this Canaanite god or his father the chief Semite god El, that the name Israel itself ‘means ruling with El’. Yahweh, like Baal Hadad, was a storm god, an epithet I believe that echoed from the time the weather went haywire from an impacting asteroid and super – cyclonic weather swept out from the impact site. In the microcosm of this example this is exactly what other ancient artists did when wishing to depict their various religious deities. They turned for artistic inspiration from earlier rock art forms. 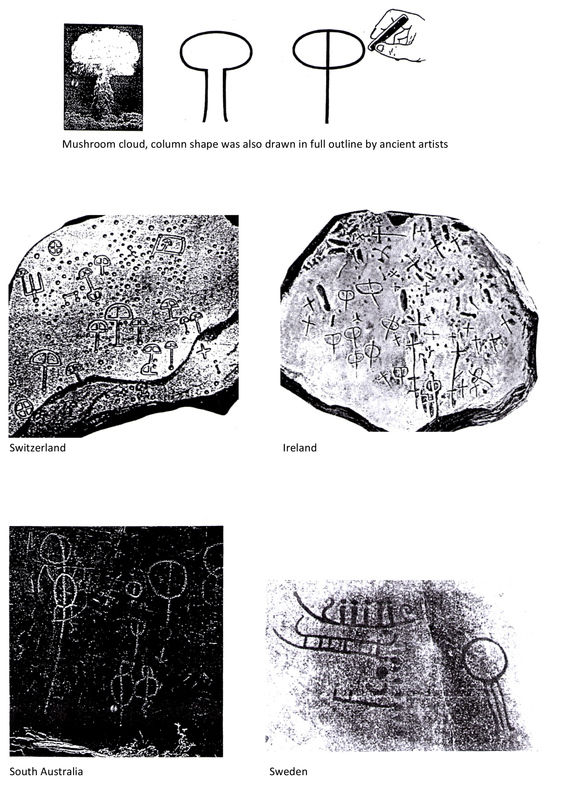 Rock art they knew was associated with the earth shaking commotion from an asteroid impact, eruption sight. While the depiction of the eruption sight was schematised by many ancient rock artists to just a half arc or underline shape to define the outline of the mushroom cloud canopy due to the effect of light and shadow cast by the brilliant glare of the blazing fireball within the cloud there were also those ancient artists who depicted the whole outline of the mushroom cloud, column spectacle. 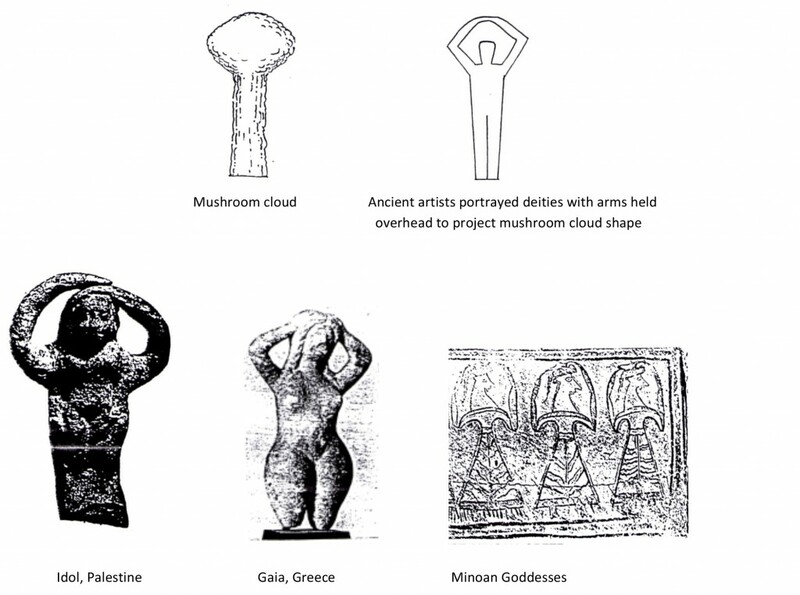 So while some early religious artists adopted the schematised rock art ‘upraised armed’ shape from the mushroom cloud eruption sight to become the template basis for their deity depictions other artists choose to use the whole mushroom cloud outline shape as the basis of their deity representations. 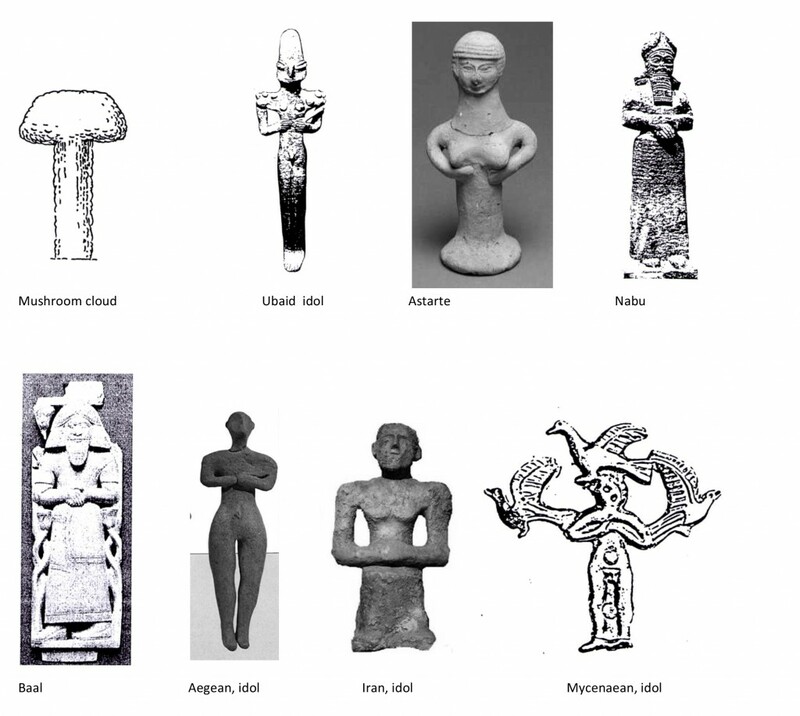 To visually approximate that mushroom cloud canopy shape with the human form they purposely portrayed their deities with their arms in a bent elbow stance, hands clasped in front of them. Thus adopting such a stance it then defined an angular outline of the mushroom canopy cloud sight to the viewer of such deity imagery. Heads were added atop the cloud form to complete the human like persona. It is this ‘bent elbowed’ stance from where the body attitude of ‘hands clasped in prayer’ originated from. When the believer of modern times ‘prays to god’ in this stance he is in effect adopting his body shape to become the eruption blast cloud itself. Yet another artistic variation to convey that same full outline mushroom cloud shape was to portray their deities and idols with their arms held overhead in a clasp which defined a more rounded outline shape of the mushroom cloud sight to those viewing the deity. In summary as the saying goes, a picture says a thousand words, and for all their various different colourful mythological written accounts, for all the debate over what such written mythology connected with each deity presented here means, and what generations of archaeologists and anthropologists have not fathomed is why such deities are all consistently visually portrayed to us shaped in the curious configured forms I have shown. What written mythological description has not told us at all is the ancients were worshipping deities that were bomb blast forms. A bomb blast form that derived I believe from the eruption sight of a large asteroid impact event. Put in simple context, ‘god to the ancients was a large explosion’. As I mentioned there is a plethora of a near past asteroid impact evidence literally staring us in the face, as is the case with these examples. But it is imagery that has been camouflaged in the religious guise of deity personas that were later projected onto the impact, eruption event. Understandably, in the traumatic circumstances, once the ancients projected personas onto the eruption event they then became hugely emotionally ensnared and psychologically fixated with such deity personas and their comprehension became effectively blinkered and sidetracked away from the fuller background understanding of the asteroid basis behind the creation of such personas. This state of emotional fixation and blindness regarding the asteroid impact basis behind our religions exists till this day.